It’s been a long time since we’ve seen a steelhead season like this on the Smith River. There’s been no pressure this year. It’s the quietest I’ve ever seen this river in at least 20 years. It’s bizarre. 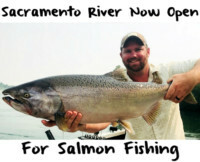 A lot of it has to do with the lower water allowing other systems in Northern California to be fishable. This year guys were able to take advantage of the main stem of the Eel and Klamath, because they’ve been low. Normally, there’s more pressure here because those rivers aren’t fishable. The lack of heavy rain allowed the pressure to spread to other systems. As you’ve guessed, we’ve had a lot less rain than normal. This season our rain came in December. We had an early run of fish that came through right away and then there was a lull in January and mid-February, which is usually the peak of the run. In January we had a one-to-two fish average, whereas now we are looking at a five-fish average. That’s a little abnormal for steelhead season. Normally, about now it starts to taper off, but it’s actually got better. There’s lot of fish in the system and they are all new fish. We haven’t even been catching any downers yet. Usually, we’ll pick up downers by mid February. I don’t think we are seeing the bulk of the run. I think that came through in early December and January, but we’d had a delay in the middle of the run for some reason and now these fish are going to start coming. There’s a good possibility there’s going to be a wet March and April. There’s a good chance those fish are taking advantage of that late water. Normally, the winter run cutthroat trout follow our steelhead and we haven’t seen any of those yet, either. 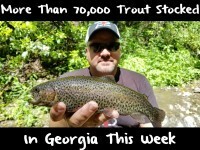 Basically, if the run is tapering off in February we start to pick up a lot of cutthroat and I’ve barely seen any. This tells me there’s a lot of fish still to come. Looking at the numbers of fish in the river right now I suspect March to be a strong month. It’s insane. 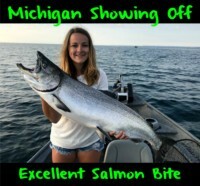 We are catching fresh fish! Having 10-13 fresh fish steelhead days in March is pretty surprising here. We didn’t do anywhere near as good in January. The fish are a little later this year. Fishing is pretty standard. I’m side drifting roe and a Puff Ball. I haven’t even pulled plugs this year and usually later in the season we use lots of plugs. The roe bite has been phenomenal. I’m just using Natural Pautzke BorX O Fire and a Puff Ball. That’s all I need; dime size pieces of bait. Generally speaking, I’m going to be the only one fishing here in March. Most of the guides have gone other places, like they normally do. It’s going to be spectacular though and I haven’t been able to say that some years in March and April. I don’t remember even seeing this many fresh fish this late in the season and I’ve been guiding since 1981 and lived here my entire life.